Plenty of people like to get away from the grind of the city by packing up some gear in the 4WD and heading off to the middle of nowhere for the weekend. However, things have changed a bit since the days when a tent, an Esky and a billycan were all anyone needed to enjoy a couple of days in Woop Woop. 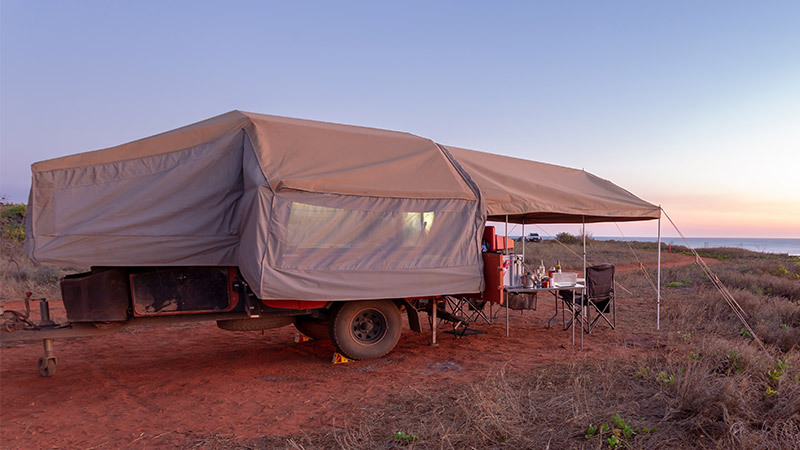 Today, there are all manner of items you can haul off to the bush with you – refrigerators, portable lighting, televisions, DVD players – and while there is nothing wrong with having some creature comforts at hand, you need power to be able to use them, and that is where dual battery systems come in very handy. There are two main types of 12v vehicle batteries - cranking batteries and deep cycle batteries. Cranking batteries are designed to supply a big boost of current in a short space of time and are used to give a vehicle’s engine the kickstart it needs to get moving. Deep cycle batteries are designed to produce a more consistent flow of power over a longer period of time. In a dual battery system then, it is the deep cycle battery that is required to run all those extra gadgets and gizmos you may want to take on your trips. WHICH DEEP CYCLE BATTERY SHOULD I CHOOSE? While there are many different types of deep cycle batteries available, the Absorbent Glass Mat Battery (AGM) is most suitable for the task of running accessories. They are extremely sturdy, cannot leak acid (which is absorbed into the internal matting), recharge quicker than standard batteries and have a longer lifespan. Things get a bit complicated from this point as the type of accessories you want to use are important when calculating the requirements of the AGM battery you’ll need to power them. To really be on top of things you are going to need to be wearing your science hat and understand some electrical terminology. Amps: The measurement (current) of the flow of electricity. If you think of electricity as water running through a hose, then the Amperage refers to how much water is flowing. If Amps refers to the amount of water flowing through the hose, Voltage refers to the pressure forcing it through. DC (Direct current): Electrical current that flows in one direction. AC (Alternating current): Electrical current that changes direction. AC is used in buildings. Knowing what these terms, and the numbers associated with them, mean is important when calculating the requirements of the auxiliary AGM battery. Deep cycle batteries are rated in amps per hour (AH). This refers to how many amps the battery can put out over a 20-hour period. For example, if a 12v battery is rated at 100 amps per hour, it can deliver 5 amps over a 20-hour period before running flat. Put another way, it can deliver 20 amps over a 5-hour period. Rather annoyingly (considering batteries are rated in amps per hour), not all accessories are rated in amps, some are rated in watts. Amps = Watts divided by Volts – for example, a 60-watt light at 12 volts means the required amps will be 60 (watts) ÷ 12 (volts) = 5 amps. If you add up all required amperage to run your appliances and accessories over the number of hours of usage per day, this will give you the AH requirement of your battery. CAN I USE MY HOUSEHOLD APPLIANCES? There are plenty of 12v appliances available – from fridges to heaters, televisions to compressors – that can run directly from battery power. However, you can, should you wish, run 240v home appliances too. To do that, you’ll need a power inverter that converts the 12v DC battery power to the 240v AC power those appliances are designed to use. Inverters are available in a variety of sizes and are made to deliver power anywhere from a few hundred to several thousand watts. If you are going to take 240v appliances on your trip, look for a label on the device that tells you the wattage it requires to operate. This is important as the power the inverter is rated to deliver must exceed the total wattage of all the devices that you plan to run simultaneously. It’s also worth noting that most devices will draw a higher wattage than labelled when they first start up. This is known as peak or surge, and this information should also be listed on the label. HOW DO I CHARGE THE AUXILIARY BATTERY? Deep cycle batteries have different charge and discharge characteristics from a starting battery and there are several systems that can assist in charging. It is important to note that connecting an extra battery directly to the original battery can cause damage to the electronics and electrical system on our vehicle. A standard dual battery system might use a battery isolator. This is a component that allows for direct current (DC) from the vehicle’s alternator to be used to charge both the starter and auxiliary battery, but also means each battery is isolated from the other - meaning if one battery is dead, it doesn’t drain power from the other. Rather than an isolator, a DC-to-DC charger is a common addition these days to a dual battery system. It too utilises the alternator but can increase the voltage to the requirements of the auxiliary battery. On most DC-to-DC chargers, you can select the type of auxiliary battery being used which enables the regulation of the charging rate. Solar charging has become a very popular additional charging method in recent years and many DC-to-DC chargers have a provision for a solar panel to be connected. They also allow for charging to be automatically switched between the vehicle alternator and a solar panel. Yet another system that can be installed is a Battery Management System (BMS). A pretty high-tech piece of equipment, a BMS can monitor and report on the state of the batteries and, like the DC-to-DC charger, allows for battery charging from both the vehicle’s alternator and from a solar power system. Additionally, decent models allow for charging from a 240v system – a particularly useful feature if you find yourself parking up for the night at a campsite with power. As you can see, getting set for a weekend (or longer) away with enough battery power to run all the gadgets you want is not as simple as it seems. To do it right requires a fair bit of thought and preparation and, as with anything to do with something as important as your vehicle, if you’re not absolutely certain of what you are doing, it’s much better (and safer) to get a professional to help you out.